Phylogeny of Iguiania and Gekkota; Squamate reptiles of Palearctic and South-Eastern Asia regions: biogeography, ecology, morphology, taxonomy, phylogeny, evolution of integument and derivatives structures; phylogeography and ecology of wide distributed Eurasian amphibians and reptiles; conservation of amphibians and reptiles of North Eurasia. About 50 field trips to Kazakhstan, Uzbekistan, Tajikistan, Kirgizstan, Moldavia, Ukraine, Turkmenistan, Armenia, Georgia, Azerbajan, Dagestan, South-Eastern and North-Western regions of European part of Russia; Iran, Turkey, Mongolia, China, Vietnam, Thailand and Australia. Ananjeva N., Iohanssen L., and Duisebayeva T. 2000. Skin receptors of Laudakia (Agamidae, Sauria) with some comments about scalation of Asian rock agamids. Russian Journal of Herpetology, V.7, N.1: 51-60. Macey R. J., J. A. Schulte, II, A. Larson, N. B. Ananjeva, Y. Wang, N. Rastegar-Pouyani, R. Pethiyagoda and T. J. Papenfuss. 2000. Evaluating Trans-Tethis Migration: An Example Using Acrodont Lizard. Systematic Biology 49: 233-256. Macey J. R., James A.Schulte,II, Haji G.Kami, Natalia B.Ananjeva, Allan Larson and T.J.Papenfuss. 2000. Testing hypotheses for vicariant separation in the agamid lizard Laudakia caucasia from mountain ranges of the Northern Iranian plateau. Molecular Phylogenetics and Evolution, 14(3):479-483. Macey, J. R., N. B. Ananjeva, Y. Wang, and T. J. Papenfuss. 2000. Phylogenetic relationships among Asian gekkonid lizards formerly of the genus Cyrtodactylus based on cladistic analyses of allozymic data: Monophyly of Cyrtopodion and Mediodactylus. Journal of Herpetology, 34:258-265. Ananjeva N.B., T.N.Dujsebayeva and U.Joger.2001. Morpological study of Squamate Integument:more evidence for the metataxon status of Leiolepidinae. Journal of Herpetology, Vol. 35, 3: 69-74. Smirina E.M. and N.B.Ananjeva. 2001. About the aging and life longivity of desert lizards of Phrynocephalus genus. Zool. Journ., Moscow, N 1: 39-43. Hallermann J., N. B. Ananjeva and N.L.Orlov.2001. On a remarkable collection of reptiles and amphibians ñollected by the German Indian Expedition 1955-1958. Russ. J. of Herpetology, vol. 8 (1): 25-34. Kalyabina S.A., K.D.Milto, N.B.Ananjeva, U.Joger and M. Wink. 2001. Phylogeography of Lacerta agilis based on the Mitochondrial cytochrome b Gene Sequences:First Results. Russ. J. Herpetology, vol.8, n.2: 151-160. Ananjeva N.B. and Kalyabina S.A. 2001. Analysis of mitochondrial DNA as a method of phylogenetic and biogeographic research in herpetology. First Meeting of Nikolsky' Herpetological Soc. Moscow: 18-21 (in Russian). Kalyabina S.A., K.D.Milto, N.B.Ananjeva, L. Legal, U.Joger and M. Wink.2001. Phylogeography and taxonomy of Lacerta agilis: molecular approach. First Meeting of Nikolsky' Herpetological Soc. Moscow: 112-115 (in Russian). Ananjeva N.B. and B. Stuart. 2001. The agamid lizard Ptyctolaemus phuwuanensis Manthey and Nabhitabhata, 1991 from Thailand and Laos represents a new genus. Russian Journal of Herpetology, vol.8, n.3: 165-170. Orlov N., Ananjeva N., A.Barabanov, S.Ryabov and R.Khalikov.2002. Diversity of vipers (Azemiopinae, Crotalinae) in East, Southeast, and South Asia: Annotated checklist and natural history data (Reptilia:Squamata:Serpentes:Viperidae). Faunistische Abhandlungen. Staatlishes Museum fur Tierkunde.Dresden. Bd. 23, Nr. 10. S. 177-218. Orlov N., Ananjeva N. And R.Khalikov. 2002. Natural history of pitvipers in Eastern and Southeastern Asia. in: "Biology of the Vipers" Schuett, G., Hoggren, M.,Douglas, M. & Greene, H. (eds.):1-15. Grismer L.L. Shi Haitao, N.L.Orlov and N.B.Ananjeva. 2002. A new species of Goniurosaurus (Squamata:Eublepharidae) from Hainan Island, China. Journal of Herpetology. Vol. 36, n.2: 217-224. Orlov N.L., R.W. Murphy, N.B.Ananjeva, S.A.Ryabov and Ho Thu Cuc. 2002. Herpetofauna of Vietnam. A checklist.Part I. Amphibia. Russ. J.of Herpetology. Vol.9, n.2:81-104. Hallermann J., Natalia Ananjeva, Nikolai Orlov and Frank Tillack. 2002. The historical collection of Amphibians and Reptiles from Burma (Myanmar) in the Zoologischen Museum Hamburg (ZMH) made by Leonardo Fea 1885-1889. Mitt. Hamburg Zool. Mus. : 25-36. Ananjeva N.B. 2002.Biodiversity of herpetocomplexes of arid regions of Palearctic: comparative analysis of morphological, molecular and faunistic data. Arid ecosystems. Vol. 8, N. 17: 7-12. Ananjeva N.B., Podlipayev S.A. and Pugachev O.N.2002. Bank of genetic resources. Zoology. 2002. Priroda: 17-18 (in Russian). Barabanov A., Ananjeva N., T.Papensuss and Wang.2002. A new name for Phrynocephalus theobaldi orientalis Wang, Papenfuss et Zheng, 1999. Russ. J. of Herpetology, Vol. 9, n.1: 80. Ananjeva N., Bakiev A., V.Garanin, A.Malenev. 2003.Chronics and information. International meeting «Snakes of Eastern Europe». Zool. Zhurnal.V.82, N.11: 1407-1408 (in Russian). Ananjeva N.B. E.M.Smirina and N.G.Nikitina. 2003. Dentition of Phrynocephalus melanurus. Does tooth number depend on body size and/or age? Russ. J. Herpetology. Vol. 10. n.1: 1-6. Pang Junfeng, Yuezhao Wang, Yang Zhong, A. Rus Hoetzel, Theodore J. Papenfus, Xiaomao Zeng, Natalia B.Ananjeva and Ya-ping Zhang. 2003 A phylogeny of Chinese species of the genus Phrynocephalus (Agamidae) inferred from mitochondrial DNA sequences. Molecular Phylogenetics and Evolution.Vol. 27 (2003): 398-409. Sideleva O.G., Ananjeva N.B., Ryabov S.A., Orlov N.L. 2003. The comparison of morphological and molecular characters inheritance in family groups of rat snakes of genus Elaphe (Serpentes: Colubridae). Russ. J. Herpetology. Vol.10, N.2. P.149-156. Orlov N., N.Ananjeva, S.Ryabov and D.Rao.2003. Venomous snakes of Southern China. Reptilia. The European Herp Magazine. N.31: 23-33. Sideleva O., Ryabov S., Ananjeva N.B., Smirnova J. 2003. Inheritance of Morphological and molecular characters in family groups of snakes of Elaphe genus. Zool. Sessions. Annual Reports 2002 (Proc. Zool/Inst. RAS). Vol. 299: 121-130. Ananjeva N. 2003. Comparative analysis of limb proportions in five sympatric Species of Eremias. Russ. J. Herpetology. V.10, N.2. P.140-145. Ananjeva N., Orlov N. 2003. Die Amphibien und Reptilien eines TieflandfeuchtwaldShutzgebieted in Vietnam. Review to the monograph Of Thomas Ziegler. Herp. Review. V.34, N.4:404-405. Ananjeva N.B. 2004. Phylogeny and biogeography of agamid lizards (Agamidae, Lacertilia, Reptilia): review of conceptions and results of molecular and morphological research. Uspechi sovremennoi biologii 124(1): 44-57 [in Russian]. Kalyabina-Hauf S., K. D. Milto, N. B. Ananjeva, U. Joger, T. I. Kotenko and M. Wink. 2004. Reevaluation of the status of Lacerta agilis tauridica Suchov, 1926. Russ. 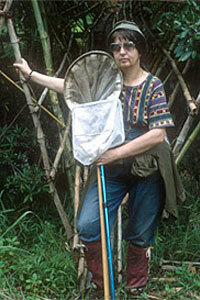 J.Herpetology. V.11 (1): 65-73. Macey J.R.and N.B.Ananjeva. 2004. Genetic Variation among agamid lizards of the Trapelus agilis Complex in the Caspian-Aral Basin. Asiatic Herpetological Research.Asiatic Herpetological Research. V.10: 1-7. Kalyabina-Hauf S., N. Ananjeva, U. Joger, P. Lenk, R.W. Murphy, B. L. Stuart , N.L. Orlov, Cuc Tho Ho and M. Wink. 2004. Molecular phylogeny of the genus Acanthosaura (Agamidae). Current Herpetology, Vol.23 (1): 12-19. Ananjeva N., Darevsky I.S. 2004. Herpetological research in Zoological Institute, Russian Academy of Sciences. Basic zoological research. Theory and methods. Proc.Internat. Conference 170th Anniversary of Zoological Institute, 23-25.10.2002 S.D.Stepanyanz(ed.). KMK. P. 27-36.